Key to retaining popularity in the fast-changing South Korean market is introducing customized editions, according to SsangYong Motor, the South Korean unit of Indian carmaker Mahindra & Mahindra. Competing in the compact sport utility vehicle segment, the carmaker’s top-selling Tivoli SUV launched in January 2015 is credited for igniting demand for compact SUVs here. In the first year of its launch, 45,021 Tivoli SUVs were sold and stood for more than half of 82,308 compact SUVs sold here in the year, the company said. Last year, the company sold 55,280 units of the vehicle, up about 22.8 percent from 2015. Amid heated competition in the popular segment, with carmakers such as Hyundai Motor’s Kona SUV rising as a rival, SsangYong Motor has managed to retain local drivers’ preference for Tivoli by consistently rolling out variations. 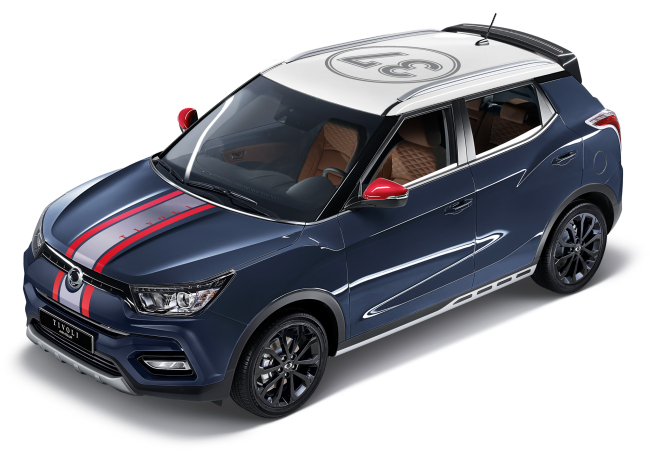 SsangYong was the first here to offer customized SUVs, giving trendy drivers the option to express their identity through the Tivoli Armour Gear Edition launched in July 2017, the company said. Drivers can customize the compact SUV by mixing and matching the design and color of various components such as the car body, interior ornaments and the roof. Tivoli is equipped with safety systems such as the forward collision vehicle warning system and the lane departure warning system, the company said. In recognition of its top level of safety, Tivoli SUV was recognized by the Ministry of Land, Infrastructure and Transport as the safest vehicle being sold in 2015, earning 91.9 points out of 100 in the ministry’s Korean New Car Assessment Program. It was also named Family Car of the Year 2017 by Belgium’s automobile association VAB, among other accolades, the company said.